We have invested in the latest battery powered LED lighting to compliment our continually growing hire stock. Prolights Smartbat LED uplights not only take power from a battery, but also have a wireless DMX function, removing the need for control cables. With a 12hr run time and even a phone app to do away with having to hire a lighting desk, these units are a must for any future project. 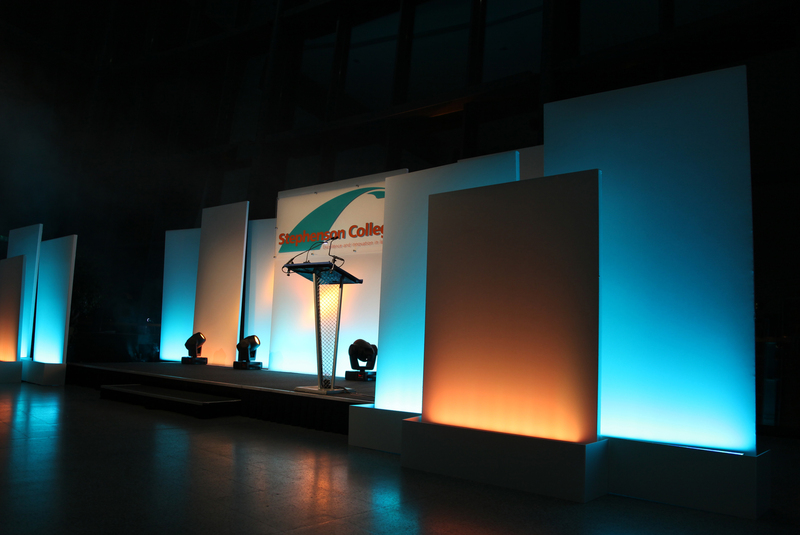 Call our hire department on 01283 515467 to get these lights on your event!! We’ve been having a big sort out over the last six months! Loads of junk was cleared when we moved units, and now a selection of ex-hire equipment has been made available and given its own section on our website. The first item here is our trusty Avolites Pearl 2000, which served us well from when we first started the business, right up until we upgraded our lighting control to the latest Avolites Titan software and systems. We have now completed our move into our new premises, almost doubling the size of our storage space. This move has taken some time as the fit out as preparation of the new space had to be undertaken around a busy summer of events, however the primary goal of being in before the busy final quarter of the year was achieved. The new unit will allow us to progress with our growth and provide a comfortable working space for a number of years to come. As we have moved within our existing business park, our address and contact details remain the same. 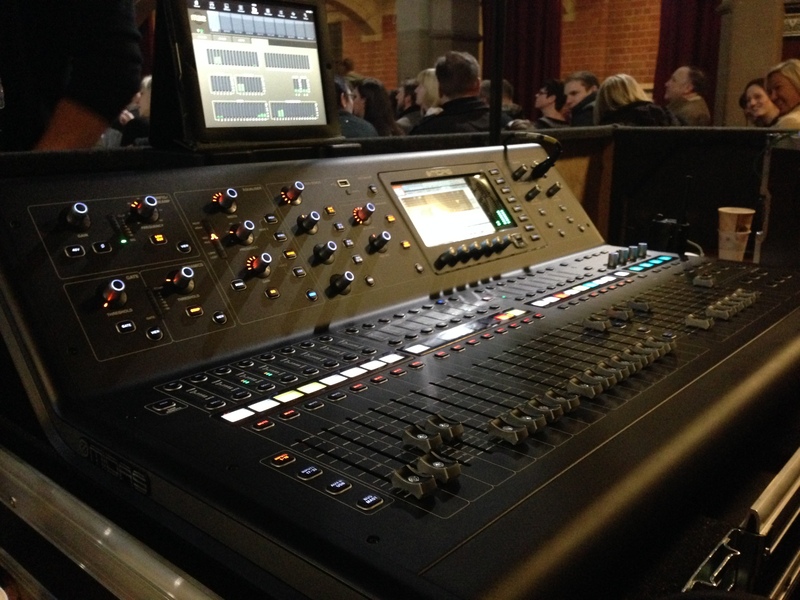 We have recently added a Midas M32 digital audio console to our production stock. This console has allowed our large scale audio projects to move from analogue to digital control, utilising the latest addition to award winning consoles from the legendary UK manufacturer Midas. Our new console is housed in a custom case and is supplemented by Midas DL16 digital stages boxes and a 75m Cat5 desk to stage link. We look forward to bringing this desk to your project – and to the weight it saves on the vans!! We have completed the purchase of our first Starcloth sheets – 108 m2 in total!! Custom made by Universal Stars, this LED starcloth is constructed from heavy duty black serge drape and uses hundreds of high brightness/low heat LEDs to simulate the night sky. Ideal as a backdrop, marquee ceiling, or behind the top table at a wedding with our pleated white silk overlays. 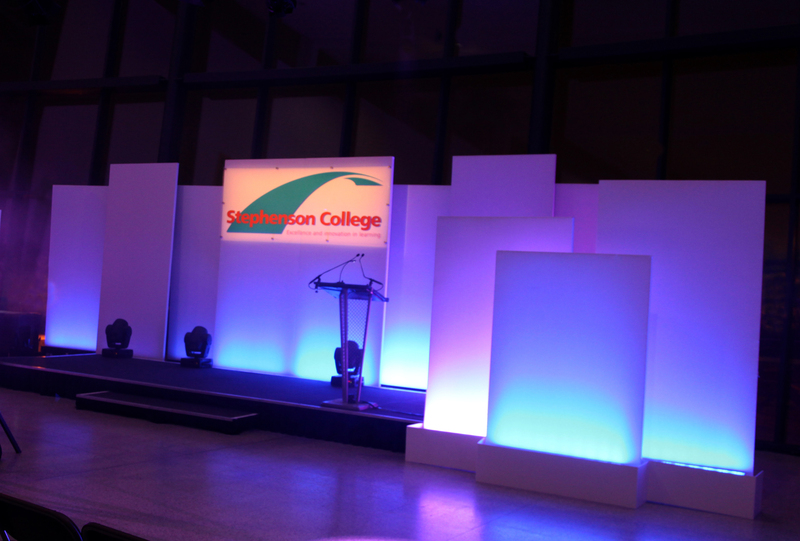 Scorpion Event Solutions provided the complete production solution for the 8th year in a row for the annual graduations and awards at Stephenson College. 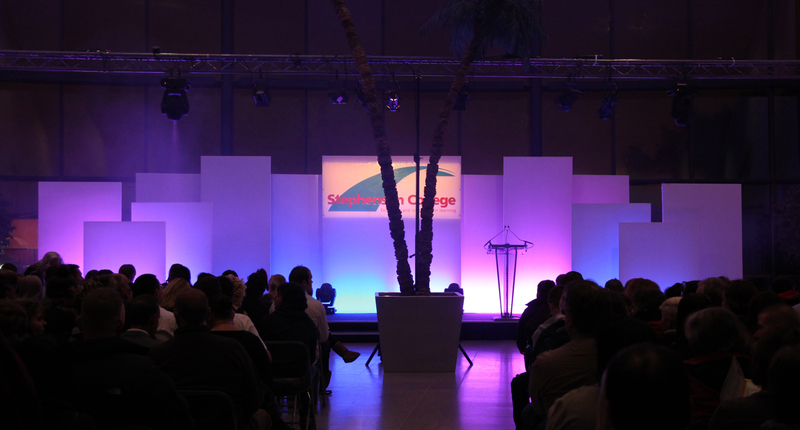 Working with the college communications and marketing team, we produced a multi-layer set design with LED lighting providing a mix between the college colours and awards stings. Martin Moving lighting was used to provide dynamic effects and gobo projection. Zero 88 dimming was used for the conventional lighting which included a number of fresnels and source 4 profiles. The lighting was controlled via Avolites Titan software. 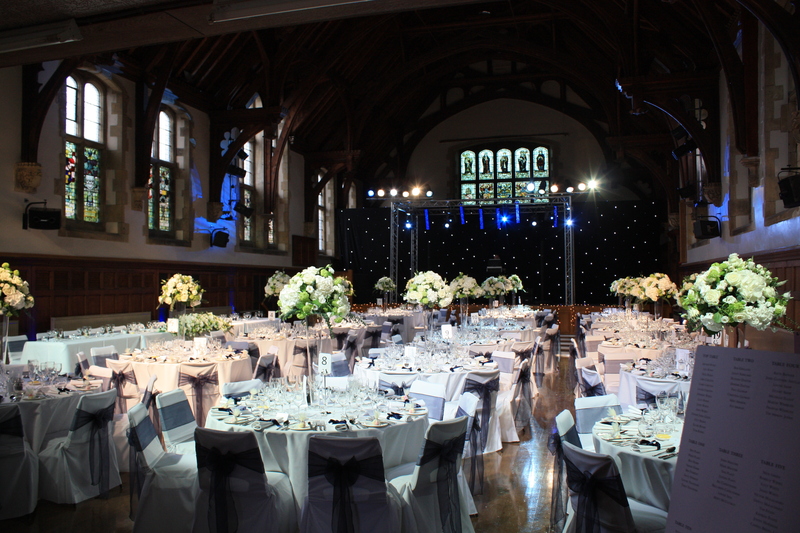 A Turbosound PA system was used, including added bass speakers to ensure the music was powerful and the speeches could be heard clearly. Sennheiser radio microphones were used in conjunction with Shure and AKG microphones, all run from a Yamaha digital sound desk. The shows were run throughout November and into December, and each one was installed and removed on the same day as the event. 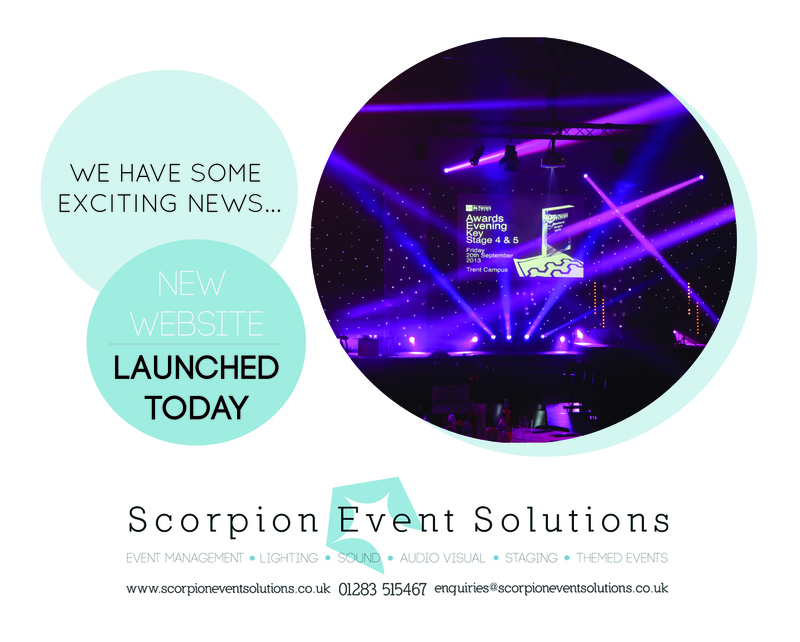 Hello & welcome to Scorpion Event Solutions.